Nailer is tough, like his name, wiry and small, which is lucky, it means Nailer gets to work on the lite crew that’s stripping the innards of a beached oil tanker on Bright Beach in the Gulf of Mexico. He’s sweating in as he's stripping out copper wire because it’s so valuable and this is the ‘best’ job a kid can get if you are lucky enough to be malnurished and undersized. 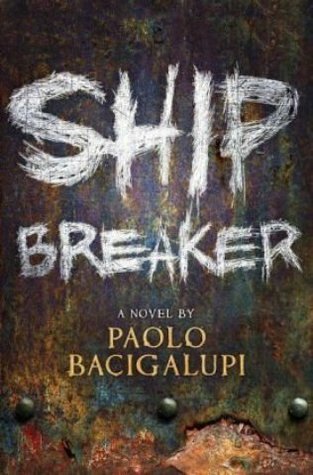 Ship Breaker (shortlisted for the National Book Prize) is set in our very likely post-oil future in an impoverished and mostly illiterate America. Great white sailing hi-tech clippers reign on the high seas but they aren’t America but Indian or Chinese – wealth and power has shifted globally and the post-industrial US is an economic backwater with little influence in the world. The rich are different now and human rights are not exactly a priority. If you don’t belong to the new clans running the world you are truly worthless and expendable. Nailer’s world is the beach of wrecks and scrap metal. Pima, his immediate crew leader is his friend, but even so works him hard. Then there’s Sloth who wants Nailer’s job and will do anything to get it. Nailer’s Pa is a vicious drunk, his mother dead. Nailer dreads going home where he gets beaten for nothing most nights. It’s Nailer’s bad luck that he gets trapped in the entrails of the tanker, left to drown in a pocket of valuable oil by Sloth who wants to claim it for herself. Pima is all for cutting off her hand to take the rings, they could live well for years onthe gold, but Nailer doesn’t think it’s right and makes Pima somewhat reluctantly save the girl. They know they can’t keep this secret long and Nailer’s father will turn up looking for him and then seize this valuable prize for himself. Nailer’s life is about to change forever. Ordinarily you’d expect a reward and you’d be set up for life, but Nita is a fugitive and there are a great many people want her captured or dead, including Nailer’s evil father who intends to make a killing of his own. Nailer escapes with Nita, joined by Tool, a half-man, half-dog, a renegade genetic mutant worker/soldier as they make their way to the great clipper port of Orleans.